I am writing this as I sit and watch the annual viewing of The Hobbit and The Lord of the Rings trilogy over the Christmas holiday. The next couple of weeks of time should provide the time necessary to hopefully complete the Infrastructure-as-Code project I undertook last month. 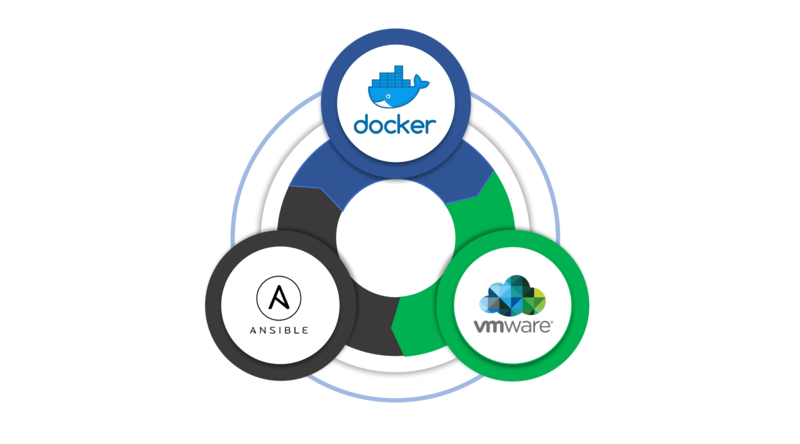 As part of the Infrastructure-as-Code project, I spoke previous about how Ansible is being used to provide the automation layer for the deployment and configuration of the SDDC Kubernetes stack. As part of the bootstrapping effort, I have decided to create a Docker image with the necessary components to perform the initial virtual machine deployment and NSX configuration. 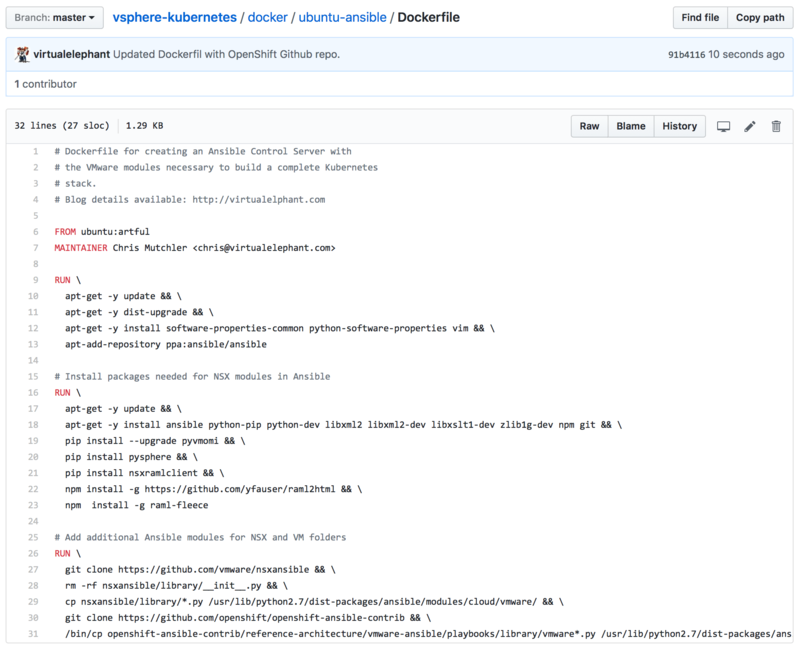 The Dockerfile for the Ubuntu-based Docker container is hosted both on Docker Hub and within the Github repository for the larger Infrastructure-as-Code project. When the Docker container is launched, it includes the necessary components to interact with the VMware stack, including additional modules for VM folders, resource pools and VMware NSX. To launch the container, I am running it with the following options to include the local copies of the Infrastructure-as-Code project. 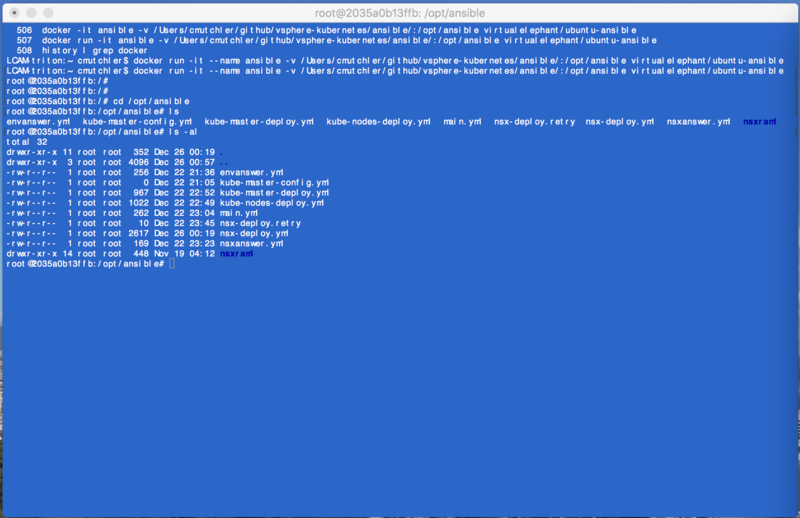 The Docker container is a bit on the larger side, but it is designed to run locally on a laptop or desktop. The image includes the required Python and NSX bits so that the additional Github repositories that are cloned into the image will operate correctly. The OpenShift project includes additional modules for interacting with vSphere folders and resource pools, while the NSX modules from the VMware Github repository includes the necessary bits for leveraging Ansible with NSX. Once running, the Docker container is then able to bootstrap the deployment of the Infrastructure-as-Code project using the Ansible playbooks I’ve published on Github. Enjoy!